The Weeknd’s hard work over the past few years has paid off, as the artist has set two new Guinness World Records. 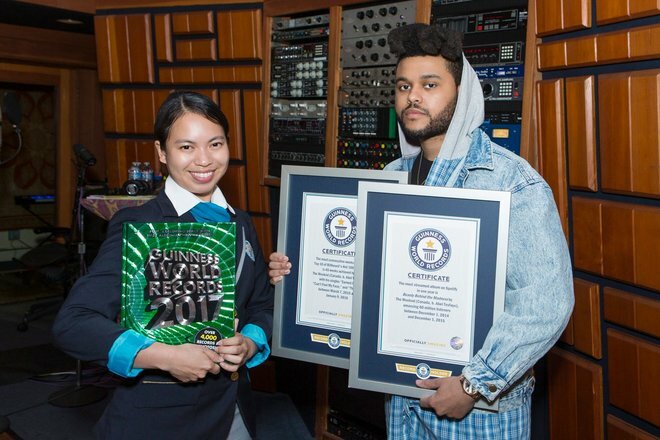 The Weeknd will be featured in the Guinness World Records 2017 Edition after breaking the record for ‘Most streamed album on Spotify in one year, current (unique listeners)’ with his breakthrough album Beauty Behind the Madness. The record amassed 60 million listeners on the streaming platform between December 1, 2014 and December 1, 2015. He also takes the title for ‘Most consecutive weeks in the Top 10 of Billboard’s Hot 100 by a solo male artist’.